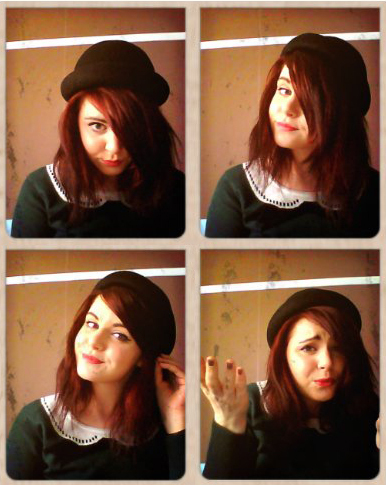 Sometime last week I purchased this lovely little bowler hat from H & M in Manchester for £7.99. Now I’m usually not into things like this. Y’know those daft hats people wear and take themselves seriously in. I usually stick to hats I can wear ironically just in case it does look stupid then I have an excuse. But this one, I tried on for a joke and actually thought I looked pretty darn good in it in the store. Now I’ve got home though I am undecided. Can the people of Stoke on Trent take someone looking this good in a hat that isn’t ironic?? I really don’t know. People around here tend to be about 10years behind with fashion so wearing something this TRENDY might get me a few dodgy looks. I know that paints Stoke in a bad light but really, it’s not that bad here, I do love this city (in a way).Now I’m being incredibly indecisive and not sure whether I can ‘get away’ with wearing it outside. That last shot is my ‘indecisive’ face by the way. I will also add it is pretty hard to take pictures of yourself in a hat. Hence why you can’t even see it very well. Would you wear a bowler hat on a casual basis? Let me know your thoughts!